As you know, Westvleteren trappist beer is among the highest rated in the world. It's brewed in a Trappist Abbey in the Belgian town of Westvleteren, close to the French border, located at about 140Km from the capital of Brussels. Three different beers are brewed in this abbey: A blonde "Westvleteren 6" wuth a green cap, the Westvleteren 8 with the blue cap and finally the mythical Westvleteren 12" with the yellow cap. These beers were fairly unknown, especially outside the world of beer connaiseurs, until about 10 years ago, when the website Ratebeer voted it as being the best beer in the world. All previous awards and publicity had gone largely unnoticed. Soon the abbey became flooded with people from all over the world, desperate to buy Westvleteren, this mythical beer. The popularity of the beer skyrocketed. Because the monks only make as much beer as they need to survive, the supply is very limited. Currently there are a few ways of getting this beer. 1. Official way #1 - buy Westvleteren from the abbey. You can only go to the abbey to buy Westvleteren if you have an appointment (a museum can be visited without appointment). To do this you must make a phone call to +32 70 21 00 45. The times at which you can call are listed here. In the screenshot below you can see that on Thu 29 Jan 2015 it was possible to call between 9AM and 12AM to make a reservation for buying the 12 and then again between 2PM and 4:30PM to reserve a spot for buying the 8. You can only call during these times. You will not be the only person calling to make an appoint to buy Westvleteren - sometimes there are up to 85,000 people calling the line every hour with only 200 of those getting through. That means you may have less than a 1% chance of getting through - be patient and keep trying. Once you do get through you wil be assigned a date and time on which you should present yourself at the gates, located at Donkerstraat 12, B-8640 Westvleteren. If you arrive earlier you will have to wait and if you arrive late then you've missed your turn. You also have to provide the number plate of your car. Once you've made the reservation, you are not allowed to make another one with the same telephone number or number plate for 60 days. 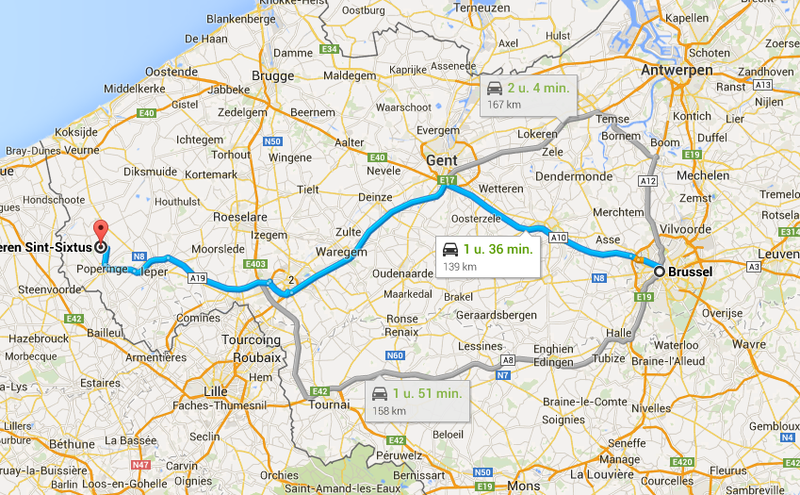 In other words, if you want to go buy Westvleteren again you'll need a different phone number and a different car. For example if you make an appointment for 15 February then your next appointment can only be as from 15 April. 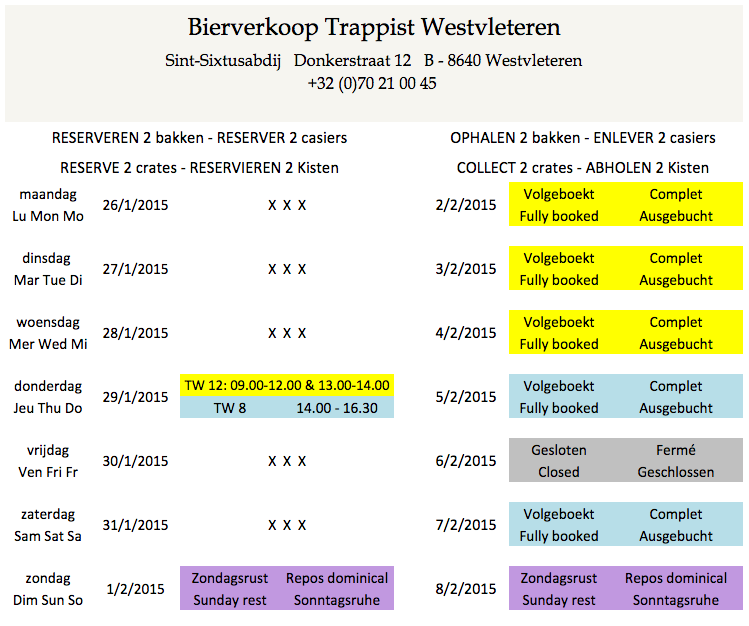 Here's a short video showing the buying process at the Westvleteren abbey. Another limitation that was recently imposed is that there can only be three different phones linked to the same number plate. So if you use your own phone, then a friend's phone and then your office phone (each time providing the same number plate), a 4th number will always be rejected. Furthermore anonymous or "hidden" phone numbers are also never accepted for the same reason. Contrary to what some people say about foreign numbers (Dutch, German) getting through more easily, this seems not to be the case. Everyone gets the same chance to buy Westvleteren. Some people have had luck using auto redialing apps on their smart phones, but this of course floods the lines even more. Once you have your appointment to buy Westvleteren you can expect to 40EUR for the Westvleteren 12, 35EUR for the 8 and 30EUR for the Westvleteren 6 - always for a crate of 24 bottles. This is of course a very reasonable price for such an exclusive beer. 2. Official way #2 - buy Westvleteren from "In de Vrede" (meaning "In the Peace"), the bar close to the Abbey and the only other official outlet of Westvleteren beers. You could even say it's the only official Westvleteren bar on the planet. The address of this place is Donkerstraat 13, B-8640 Westvleteren. They have a large outdoor teracce where you can enjoy your beers in the sun (a rare occurence in Belgium), or in their indoor modern "cafeteria". You can also sample some delicious local foods (sandwiches, cakes, cheese, gingerbread, …), including even an ice cream which has been prepared with Westvleteren beer. Group visits are encouraged but they ask you do make an appointment first to insure there's enough space. In de Vrede is always closed on Thursday and Fridays, while in July and August it remains open on all days except Friday. It's possible to visit the "Claustrum", which is a kind of museum which explains how the monks live and what their daily rituals are. At "In de Vrede" you are also able to buy Westvleteren, not just for local consumption, but also in special "six packs" to take home. You can buy Westvleteren 6, 8 and 12 in these packs, which are officially also only sold here. They are nicely packaged and make for a great souvenir or gift to take home. However, this is all subject to availability and they can't guarantee that there will be stock available. 3. Unofficial ways - Buy online. Apart from these two official ways to buy Westvleteren there are many options on the "gray" market. A simple Google search will lead you to website selling the stuff. Often they sell the beer at an exorbitant price; sometimes you pay up to 30USD per bottle - almost a 20 fold markup. Some websites I checked charge close to 700USD for 18 bottles. This includes shipping price to the USA which of course is never cheap, considering each bottle weighs around 0.6Kg, or 5Kg for a box with 6 bottles (including packaging materials). Some restaurants in Brussels also sell the beer at around 12EUR per bottle - close to the price of a basic meal and a fair price, less than a decent bottle of wine in a restaurant. This is not a bad way of sampling the beer, especially if you don't have time to make it out to Westvleteren (up to 9 hours from Brussels by public transport - you need a car!). I like to think I currently offer the best deal to buy Westvleteren online. My price is just under 10EUR per bottle and I've searched long and hard to find the best shipping rates possible. I've tried and tested many different ways of shipping the bottles and so far I have a 100% delivery success rate and not a single bottle has broken. If you're able to do - please make an appointment and visit the abbey. It's a must do experience for beer lovers and it will take you to a lovely authentic part of Belgium, away from all the tourism of Brussels, Antwerp and Brugge. For those who can't make it there - you are able to buy Westvleteren right here and now and have it shipped to your door within around 2 weeks.